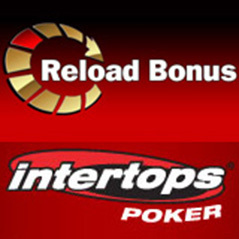 Intertops Poker regularly offers reload bonuses to its players and the 15-year-old online poker site is at it again this weekend with a special offer that will see it double competitor deposits up to $300. From February 8 to 10, players at Intertops Poker can receive this immediate reload bonus by entering the promotional code ‘re3’ after making a deposit. Intertops will also be spicing up this weekend’s action with a pair of extra freeroll tournaments that players can register for by clicking the domain’s tournaments tab. These include a $200 freeroll on Saturday at 5pm New York time followed by a $500 event the following day at 9pm. “Serving players around the world since the early days of the Internet, Intertops is one of the most trusted online poker room, casino and sportsbook sites,” read a statement from Intertops Poker. “Known for its friendly customer service and hassle-free deposits and withdrawals, Intertops gives away tens of thousands of dollars in bonuses every month." Additional information on this offer available here.